Babies are beautiful gifts from God. The Lord gives the world babies to remind us of the preciousness of life and the fragility of the young. Parents find themselves without instructions as well as the responsibility to raise their God-given gift. Babies are born helpless and demanding—they expect to be comforted whether with food, affection, or dry clothing immediately. 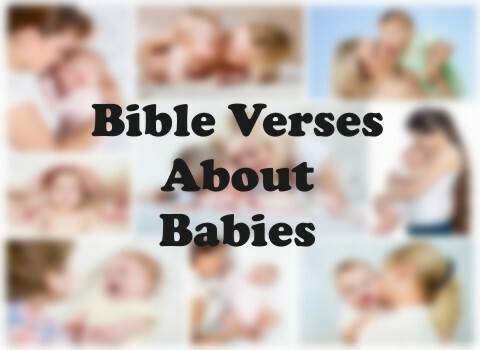 What can we learn from the top 8 Bible verses about babies? “When Elizabeth heard Mary’s greeting, the baby leaped in her womb, and Elizabeth was filled with the Holy Spirit. In a loud voice she exclaimed: ‘Blessed are you among women, and blessed is the child you will bear!’(Luke 1:41-42). When Mary approached Elizabeth, John the Baptist rejoiced! Even in the womb, John began his calling as the forerunner of the Messiah. A mother needs to be mindful of how her feelings and actions can affect the unborn child. Keeping a spirit of joy and peace in the Lord can give a baby a reason to rejoice. “Through the praise of children and infants you have established a stronghold against your enemies, to silence the foe and the avenger” (Psalms 8:2). Jesus referred to this verse when challenged by the Pharisees because the children were singing His praises. It’s amazing how the praise and faith of a small child can silence the taunts of the devil. We should always encourage babies to praise God as the Lord uses the weak of this world to confound the wise. “People were also bringing babies to Jesus for him to place his hands on them” (Luke 18:15-17). Jesus made time for the babies even when His disciples rebuked the parents. With all His miracles and fame—He still had opportunity to bless the babies. In the same spirit, parents dedicate their babies to God in church as a symbol of giving them back to the Lord for His purposes. “For you created my inmost being; you knit me together in my mother’s womb…my frame was not hidden from you when I was made in the secret place” (Psalm 139: 13, 15). Every baby is made by the Lord. Not everyone is born the way that our society deems normal; however, God has a special plan and purpose for every baby. Believers recognize the sanctity of every child as God’s chosen and special one. “She opened it and saw the baby. He was crying, and she felt sorry for him. ‘This is one of the Hebrew babies,’ she said” (Exodus 2:6). Moses’ parents recognized that their baby was a gift from God and they refused to have him murdered. The Lord protected Moses as he floated in the Nile River and provided him parental care from royalty. Babies aren’t forgotten by the Lord as He makes a way to protect the helpless. “A woman giving birth to a child has pain because her time has come; but when her baby is born she forgets the anguish because of her joy that a child is born into the world. So with you: Now is your time” (John 16:21). Mothers not only have pain during childbirth, but many mothers endure much hardship throughout the pregnancy with morning sickness to having to stay in the bed for the entire time. Yet the joy of that baby makes it all worth it. There is great happiness stirred up in the hearts of parents by the birth of their child no matter the pain. “The infant will play near the cobra’s den, the young child will put its hand into the viper’s nest” (Isaiah 11:8-9). When Jesus comes back and sets up His kingdom, it will be a time of peace like the world hasn’t known since the Garden of Eden. Not only will mankind live under the rule of Jesus, but the animal kingdom will do likewise. Parents won’t worry about the presence of reptiles around their babies at that time. “The babies jostled each other within her, and she said, “Why is this happening to me?” So she went to inquire of the LORD. The LORD said to her, ‘Two nations are in your womb, and two peoples from within you will be separated; one people will be stronger than the other, and the older will serve the younger” (Genesis 25:22-23). As cute as babies are—they will eventually grow up to become children, teens, and young adults. Even at a young age, babies show their true nature of selfishness. Diligent and prayerful parents recognize from day one that they need to love and train their babies in the ways of the Lord. The virgin will conceive and give birth to a son, and will call him Immanuel” (Isaiah 7:14). The Lord could’ve come to the earth as a powerful ruler and forced servitude—He is God. However He chose to come as a newborn baby born of a virgin in simplicity and humility. There was something significant and special with the birth of the Messiah. Our Savior chose this entrance into a world that rejected Him. Even as a baby…Immanuel reminds us that we are never alone.